The DC Extended Universe, or the remnants of it, has seemed to finally get a grasp on the creative potential of superhero films. Gone are the dreary and brooding heroes, replaced with the light-hearted, fun, and entertaining nature of Wonder Woman, Aquaman and now, Shazam!. Add in a little heart and some good old fashion magic, and Shazam! may just be the best the DCeU has to offer. We all have a superhero inside of us -- it just takes a bit of magic to bring it out. 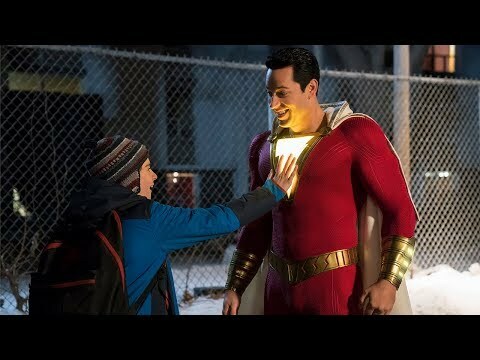 In 14-year-old Billy Batson’s (Asher Angel) case, all he needs to do is shout out one word to transform into the adult superhero Shazam (Zachary Levi). 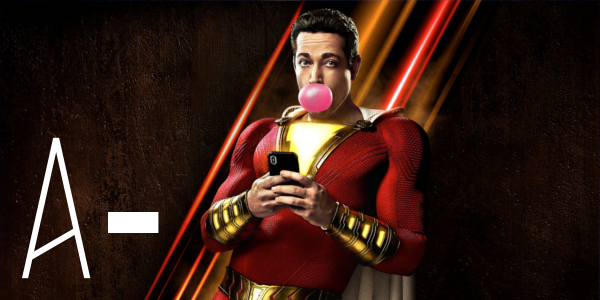 Still a kid at heart, Shazam revels in the new version of himself by doing what any other teen would do -- have fun while testing out his newfound powers. But he'll need to master them quickly before the evil Dr. Thaddeus Sivana (Mark Strong) can get his hands on Shazam’s magical abilities. The opportunities of a film centered on a fourteen-year-old kid who transforms into a superhero with a magic is ripe with opportunities for wonder and wish fulfillment around every turn. Shazam! harkens back to a simpler time, to films that were adventurous and light and fun for all ages, just with some weird comic-book elements along the way. None of it gets too complicated, but the themes of family and power shine through really well and give this film an emotional center like few big superhero films possess. Another huge opportunity is provided to Zachary Levi, who gets a highly coveted superhero role, but with a twist. He still gets all of the heroic moments associated with capes and superpowers, just with the added element of fourteen-year-old antics. And Levi absolutely knocks it out of the park, showcasing his leading mad potential and his comedic chops all in one go. Of course, there are other good performances too. Asher Angel and Jack Dylan Grazer have great comedic timing, and really develop a believable friendship over the film. Mark Strong, back for round two as a DC villain, is the perfect amount of motivated and evil as Sivana, proving there is a reason he is typecast as a villain so often. Often the most appealing element of the whole superhero craze Hollywood has been in for the past decade or so is and always will be the action. Shazam! doesn’t honestly feature too much, but when it does, its solid and exciting for the most part. The big final showdown, outside of a really fantastic surprise, gets a little overlong and some of the CGI shows some flaws, particularly on the villain end of things, but even then, Shazam! offers a quip or a visual joke that brings the audience back in. Shazam! is the epitome of DC and Warner Brothers collectively figuring out exactly how to handle a specific character and the tone they bring with them. The seeds were there in Wonder Woman and Aquaman, both of which had to overcome being tied to the darker, pre-Justice League DC Extended Universe in their solo films, but Shazam! feels like a huge step towards the whole film being exactly what it should: a comic book come to life in the best possible way.